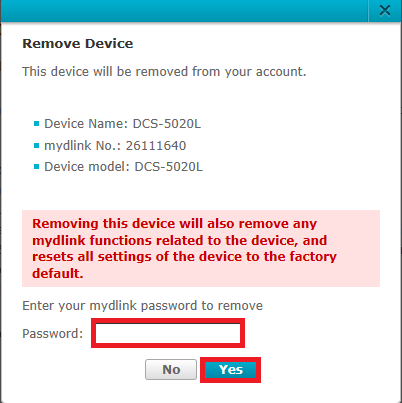 How to remove a device on D-Link mydlink account that is no longer connected or offline? Select the offline device on the left side. It should be marked with a red X. Once you have selected the device, in the lower right hand corner you should see “Delete Device…” link. Click on “Delete Device…” and you will be prompted for your mydlink password. This is your mydlink account password not your device’s password. Enter your mydlink account password, click yes. Once you have entered your password and clicked yes your device will be deleted from your mydlink account. You will see the following window click done. 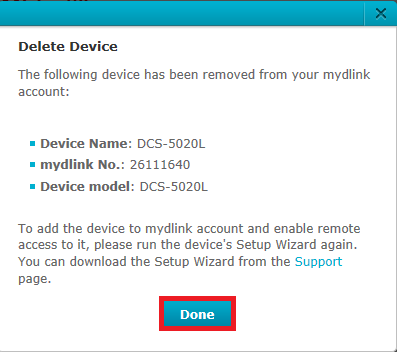 Your device should now be removed and detached from your mydlink acount. Refresh your screen to ensure it is removed from your device list on the left side of your screen. How do access media on D-Link DIR-880L router using mydlink Shareport? I’m facing the same problem. How do I remove a device from mydlink home? Yeh, I need a answer to this also, tried deleting the app and re install but thye still show up. How can I recover the device previously registered in my dlink account? How can I recover the device previously added in my dlink account?